Download your free copy of Fabulous Fabric Flower Tutorials: 7 Ways to Learn How to Make Flowers. Does your heart break every time a frost rolls through your backyard and destroys your bed of roses? Do you love the smell of lilies but your allergies can’t stand them? Flowers are Mother Nature’s accessories. Bright, beautiful, and bold, they delicately adorn the face of the Earth, exuding as little effort as a beaded bracelet does sparkling on someone’s wrist. There’s no doubt about it, flowers are Mother Nature’s bling, and now they can be yours too. AllFreeSewing is pleased to present, Fabulous Fabric Flower Tutorials: 7 Ways to Learn How to Make Fabric Flowers just for you. Absolutely free, this roundup of carefully selected fabric flower tutorials will instruct you on how to make flowers out of fabric and other materials. Whether you’re looking to spruce up your home decor or simply want to add some blooming accessories to your stylish repertoire, these 7 fabric flower tutorials are just what you need. There’s no doubt about it, Fabulous Fabric Flower Tutorials: 7 Ways to Learn How to Make Fabric Flowers will arm you with the proper sewing skills to create lovely floral arrangements. Learn how to make fabric flowers fit for your home and your wardrobe. The only challenge that this free eBook poses is which one to make first. You may wish to make fabric flowers to add to a belt, or perhaps you’d like a new hair piece for your granddaughter to wear. Fabric flower tutorials that are this well written and handsomely photographed aren’t easy to sift through. It’s a good thing you can revisit your copy of Fabulous Fabric Flower Tutorials: 7 Ways to Learn How to Make Fabric Flowers as often as you like by downloading it for free. Download your free copy of Fabulous Fabric Flower Tutorials: 7 Ways to Learn How to Make Fabric Flowers today! When you download Fabulous Fabric Flower Tutorials: 7 Ways to Learn How to Make Fabric Flowers, you may be overwhelmed with the homemade accessory options at your disposal. From belt embellishments to sewn hair pieces, there are tons of fabric blossoms for you to create. If you’re afraid to approach your sewing machine because it’s been years since you’ve sewn, these fabric flower tutorials will ease you back into the sewing process. Denim Flower Corsage (pg. 5) - Not only do these instructions and provide tips on getting through the tight spots of this project, the final result is amazing. From adhering a pin to the back of your denim corsage to figuring out how to wear it, the low-down on this fabric flower tutorial is well documented. How to Make a Gathered Fabric Flower (pg. 46) - While intermediate and advanced sewists will love the challenge presented by these projects, total novices will like them too. 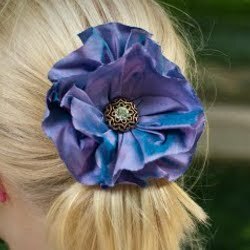 It’s as if your own personal sewing teacher is at your side when you read fabric flower tutorials like this gorgeous hair accessory. Depending on what kind of blossoms you’re after, you may decide to start with home decor fabric flower tutorials. Fabulous Fabric Flower Tutorials: 7 Ways to Learn How to Make Fabric Flowers offers several options for home dec daisies. By downloading your free copy of Fabulous Fabric Flower Tutorials: 7 Ways to Learn How to Make Fabric Flowers, you’re protecting the stylish integrity of your home. Fabric Flower Tutorial (pg. 11) - Some may wonder why they would make fabric flowers when the real thing is so enticing. After all, nothing beats getting a bouquet of authentic blossoms from your one-and-only. However, when that blooming bouquet starts to wilt and the water browns, your living room’s motif goes from glam to gloomy. Consider the fashionable possibilities like these faux flowers offer. 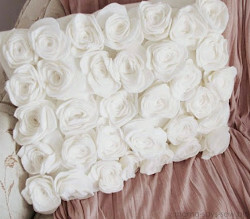 Rose Pillow (pg. 29) - Nothing has quite the same effect on a room than an eye-catching pillow. Let the focal point of your couch or armchair be this gorgeous Rose Pillow and watch as the aesthetic in your home grows tenfold thanks to this fabric flower tutorials. Believe it or not, you're not the only one! If you need assistance downloading this project garden of sorts (pun intended), please refer to our FAQ section, How to Download Our eBooks. There's more! If you loved this read on how to sew fabric flowers or if you didn't like it at all, there are other available eBooks free for download. Arranged thematically you can find the right group of projects and save them for a later date. See our full collection of eBooks right here. You know your curiosity is peaking just a tad. You’ve got nothing to lose and everything to gain by downloading Fabulous Fabric Flower Tutorials: 7 Ways to Learn How to Make Fabric Flowers. Learning how to make fabric flowers enables you to expand your crafting projects in an innovative way. There’s simply no point in settling for the same patterns when you can easily add pizazz to your designs. At the very least these fabric flower tutorials will let you brush up on your basic sewing skills. Easy, fun, and sophisticated, these lessons on how to make fabric flowers are worth downloading. This e-book has some really cute flowers in it. I like using fabric flowers to embellish bags that I sew and it is always great to have a couple of new ideas on hand. I love these fabric flowers! They would look great adorning a fabric/felt indoor wreath for a bedroom, hall, or bathroom. Or I could put them on a canvas frame for a wall hanging. I'll find several ways to use these fabric flowers! I think they're so neat! It's free - and better quality than some of the $2.99 ebooks on Amazon. Color photos w/step-by-step instructions, cute ideas & easy to make. I just shared it on FB for my friends to enjoy!